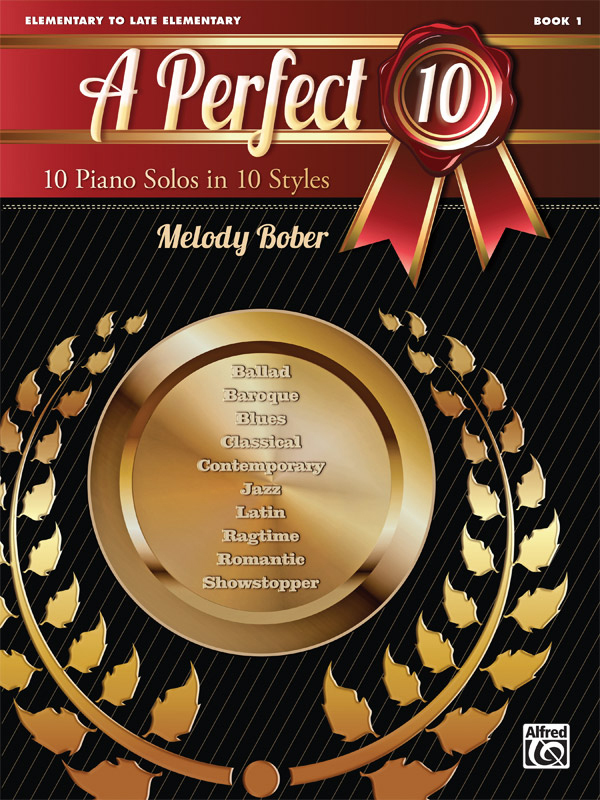 * A Perfect 10, Book 1, is a collection of piano solos designed to promote musical excellence for the elementary-level pianist. * Melody has chosen a favorite teaching piece from the four stylistic periods---Baroque, Classical, Romantic, and Contemporary---and written six original pieces in Jazz, Blues, Ragtime, Latin, Ballad, and Showstopper styles. * These 10 solos provide students with technical challenges as well as expressive opportunities for musical growth in mood, rhythm, melody, harmony, form, articulation, and dynamics. * Students do not have to be an Olympic hopeful to achieve a perfect "10," but they might feel like one as they practice and perform these selections! * Titles: Blue Shoes Blues, Dance, Got Those Monday Blues, March in C Major, March G Major, Ragtime Fun, Spanish Nights, Springtime, Study, Trampoline Tricks, Wishing Well Waltz.